Brisket is simultaneously one of the easiest and most difficult cuts of meat to cook on a barbecue. It is the easiest because all you really need is a piece of brisket (seasoning and sauces are optional); it is challenging since brisket is one of the toughest cuts of meat, and if not cooked properly, which means low and slow, then it will be inedible. Low and slow cooking is most often done in a smoker and sometimes on a charcoal grill. Many barbecue enthusiasts believe that you cannot cook a brisket on a gas grill, but there are methods that make this possible. Trim excess fat from brisket. Season with garlic powder, onion powder, black pepper, cayenne, and paprika. Place on the rotisserie and put on a preheated grill. Prop the lid a little and let cook. Meanwhile, prepare the sauce. Melt butter in a saucepan and sauté onion and garlic for about 5 minutes. Add water, cider vinegar, brown sugar, Worcestershire sauce, chili powder, and a little salt and pepper to taste. Let simmer for 10 to 15 minutes. Add beer. Baste over brisket about every 30 minutes. Cook brisket over low heat for about 4 to 5 hours. Remove brisket from grill and slice thinly. Grill in a pan: If you do not have a rotisserie attachment, you can cook the brisket in a heat-proof pan on top of the grill grates, keeping the heat low. Close the lid and baste the meat as usual. 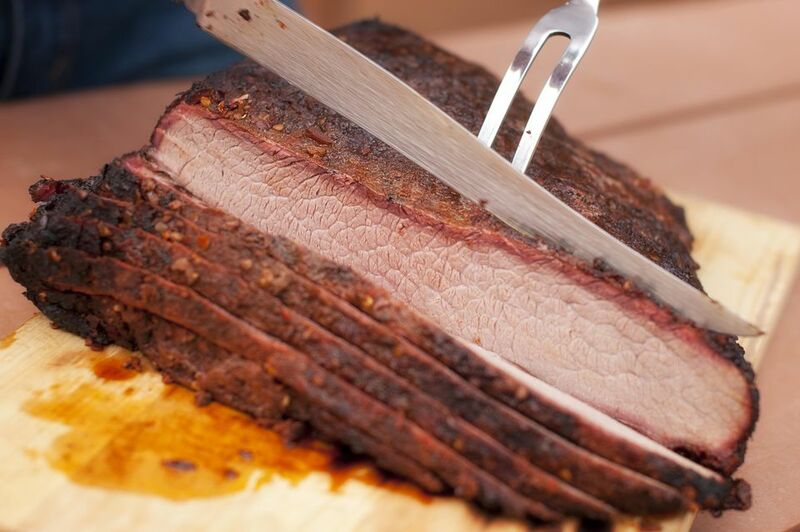 Get a crust on the meat: After seasoning with the rub, but before putting the brisket in the pan, place the brisket directly on the grill over low heat until the exterior develops a nice outer crust, turning and flipping as needed. Fat trimming: If using the rotisserie, make sure your brisket is trimmed of most fat so as to not cause flare-ups. If you are using the pan method, leave a bit more fat left on the meat to help the meat retain its moisture. Rub variations: Dry meat seasoning combinations are endless. You can add brown sugar, chili powder, cumin, and so much more. Basting sauce variations: Remember to baste the brisket with the sauce frequently and keep your grill temperature low. There are numerous possible substitutions and additions for basting sauce: olive oil, beef stock, dry mustard, Tabasco, lemon juice, and bourbon whiskey, just for starters.